Paul writes: “Here’s a real winner from Harbor Freight. Save your arm from hacksawing with this powerful tool. Having one of these allows you to fabricate many things with ease. There’s also a whole cult of the Internet of users of this tool. Get one, join in, and get fabricating!”I have to agree. I actually own one of these, though it’s the older green model. (It looks identical to the one in the picture.) It was my first bandsaw, and has since been replaced with a JET that I bought from a friend. The major differences? The HF model “howls” when it cuts because, I’d guess, of the thickness of and layout of the metal in its body. It’s also pretty short — as most bandsaws are — so I extended the legs to save my back. Seriously, though, this sells for $190 right now, and I’ve seen it on sale for even less. Who cares if it’s a bit noisy? Mine worked fine. If it wasn’t for other personal reasons, I’d probably have never replaced it. One thing that’s almost always overlooked, though, is selection of good blades and proper adjustment. Most of the time I hear someone talking about “that piece of crap bandsaw,” I suspect those culprits. For a while I thought my HF saw was junk, but after proper adjustment it cut just as well as the JET does now. I purchased the red one recently and it’s the quietest cutting power tool that I own! Apartment living requires me to buy the quietest tools possible (as a hobbyist woodworker and metal worker, it’s usually very difficult), and the HF 4×6 is almost quiet enough to use at night, on certain metals at least (flat bar and tubing, for instance, cut really quietly for me). Just don’t forget to trash the stock blade (it’s not even worth trying)! Lots of recommendations online for alternatives… I’m happy w/Lenox. They are easy to, um, Pimp Out. I’ve added a better and longer stock stop, and a larger plate for cutting in the vertical mode (without having to bolt on the flimsy sheetmetal table). I use a 10/14 tooth US made blade on mine. Two things that I have learned about band saws: they are very easy to improve upon with the right base, blades, and setup. And tuning is what makes the saw work or not–I have found that the better saws shine in tuning–they are easier to tune and dial in consistently–where my cheapo Craftsman is all over the place. I wind up spending more time tuning than cutting–which is not the case with the big Powermatic at work. I’ll bite- what exactly have you guys done to “pimp out” your saws? We’ve got a Jet in the shop and use it occasionally, but it’s pretty stock. What can you fabricate with one of these that you can’t with a hacksaw? I don’t doubt their utility – it was the only tool I regularly used to go to the blacksmiths down the road to use, and I use one all the time at work, but it’s simply because I’m lazy. MikeR says “it’s the quietest cutting power tool that I own!” Yeah I call mine my beer drinking tool. In the horizontal position once it is started, I can go off and drink a beer in peace while it is doing its thing. Bwahahahaha cough, choke ahem, OK let me compose myself a moment here. Have you ever tried sawing through a piece of railroad track with a hacksaw? As cheap as these 4×6 saws are if you pay attention to setting them up they are amazingly accurate in their cuts too. As in your cuts come out very square etc. I’ve lived without one and now I am living with one, and without one I didn’t start too many projects, and the ones that I did make had a very rough look to them. 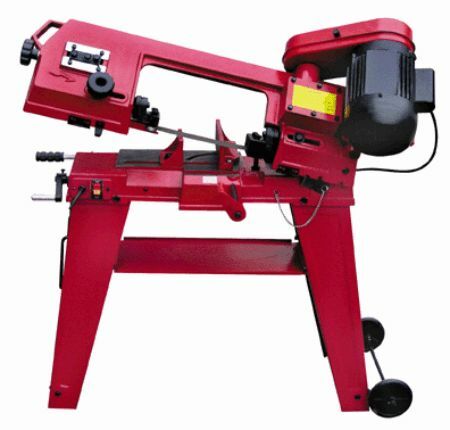 The bandsaw is the first step in metal fabricating. Sizing stock is job 1. Sometimes it is the only machining step one needs to do in order to fabricate something. 3″ C channel is one of my favorite structural shapes to work with. I call it steel 2x4s. It has the strength I am typically looking for in a part. And the shape, I mean what could be handier? And I just can’t imagine hacksawing through this stuff once, let alone the dozens of times it typically takes me to make something. And even if I did manage to hacksaw through a piece of this stuff, I can well imagine how cockeyed the cut would be. In short, the bandsaw is step one, and often the only machining operation one must perform in order to fabricate something. People often walk around with images of lathes, or mills in their minds, only to find out that the bandsaw was the first machine they should have aquired. Well I have an older 4×6 and it came with the ultra crappy flapping in the breeze sheet metal stand, so I put a crossbar between the stand legs to stiffen that up. Then the wheels my saw came from were like a bad joke or something, so I made a dolly for my saw, and took the joke wheels off of it. That is all I have done to mine. I still need to make a better table for using my saw in the vertical position. The stamped piece of junk that the saw comes with is just about worthless to use. I have made a piece of MDF that is better. I have to do better than that though. I can easily say I’ll probably buy one of these (well the available to Canada equivalent) in the next 2-3 years. I know it will take up too much room in my shop, but for any sort of metal fabrication it will be a requirement. I love how it can be used horizontally and vertically (to cut out sheet metal, etc). I also love the fact that the online community is embracing these Chinesse tools. I think the ‘China Era’ of tools is actually awesome, as I can afford to get into the game.. maybe not with the ‘best’ tools, but ones that can get the job done for a price I can afford and justify. It’s too bad I’ve got about $1500 in parts to buy for my car before I can buy a welder and one of these bandsaws and get more into metalworking. A good site I’ve found for modifications to this and similar bandsaws is http://www.frugalmachinist.com – It’s down at the moment, but I really hope that’s just a temporary situation. I put a Baldor motor wired for 220v into mine. With the new blade it helped quite a bit. I use mine mostly for things that are too thick for the abrasive cutoff saw. Cut 2″ solid round steel stock, blocks of aluminum, etc. The motor doesn’t bog anymore, but the tension adjustment is pretty bad and the blade jumps off the wheels and/or slips quite a bit. These actually have a pretty small footprint, IMO. My “shop” is a carport and it tucks away into a corner pretty well. It’s a little tough to get a sense of scale in the photos, but these are pretty compact compared to most semi-stationary tools. Also, don’t forget to try to use one of the 20% coupons floating around on the interweb at a HF store. I struck when it was on sale for $159.99 and walked out of the store with it for $128! As a hobbyist, this is the best bargain tool purchase I’ve ever made. Used one of the HF saws all the time – the stand is certainly the weak spot, it is important that you “beef-it-up” a bit with a cross brace. I noticed that the noise level went down after bracing. We have one of the old green ones built in the 80’s & it still works. The wheels stopped working years ago, & it did need to be welded when the frame cracked, but it is still running on the original motor. We had a table for it that was made out of MDF that worked good. I’ve used the bandsaw for wood as much as I have for metal. The best thing about it is it shuts itself off once it finishes cutting. I originally bought the old green one and it worked just OK the stand was horible, I hadnt used it for while so I sold it for $125.00 after having it for two years – I regreted selling it as I again found need for one – So I re-bought the Red one for about $175.00 with coupons and spent about $30.00 making a movable stand from 1-14″ square metal stock cut with the new saw – I designed and welded all the pcs and mounted the saw to it on wheels so I can easily move it around – the stand I made brought the saw to waist high making it comfortable to work with – I spent a few hours making adjustments so it would cut to within 1/32″ true thru 1-1/2″ stock – I made other adjustmens to quiet it down and opened the gear case removed the oil and filled down the sharpt gear edges as they were damaging other components, leaving metal particles in the oil, and running a little noisy. I changed the oil and made a new seal. I painted my new stand a close match red to match the saw color – I’m real happy the way it turend out. I also added an electric outlet J-box and a 25 ft. plug in cord – the Jbox has two duplex outlets so I can plug in add’l tools. I made a flat table to the outside edge for cutting small pcs. I still need to add tooling to hold parts in the vice better. I made two stops on the vise to set 45 & 90 degree secured stops. There more I will do when the time allows.